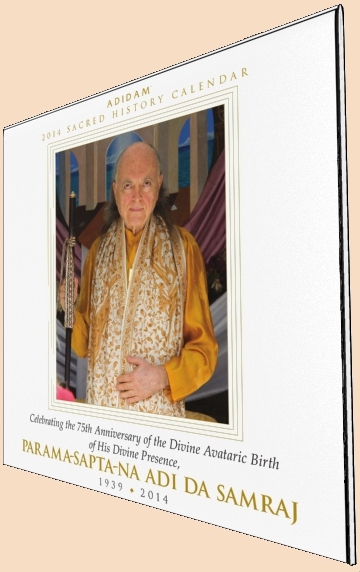 The beautiful 2014 ADIDAM™ Sacred History calendar celebrates the 75th anniversary of Avatar Adi Da’s Birth on November 3, 1939, with a stunning collection of photographs. There are two images on each monthly calendar page. The larger images are from Darshan occasions (sacred sightings of His Bodily Form) on Adi Da’s Jayanthi from various years during His Lifetime. The smaller images are remarkable photos of Avatar Adi Da in His early Life. Each month also includes a quotation from Avatar Adi Da’s Word to honor and illuminate the profound Import of His Birth. As He Reveals, through the Gift of His Incarnation, all are able to participate in the Great Divine Outshining Love-Bliss-Happiness that Avatar Adi Da Is. The calendar also features a description of the annual cycle of the Great Sovereign-Avataric Holy Days celebrated by practitioners of the Reality-Way of Adidam. Each month in the sacred cycle of worship celebrates a specific aspect of Adi Da’s eternal Blessing-Presence and Divine Work—that relates to an event during His Life that took place in that month. Several rarely seen and even never-before-published images of Avatar Adi Da grace the calendar pages (see images and quotations on following pages).